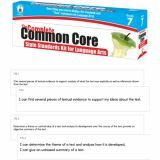 The original Complete Common Core Standards Kit for sixth grade Language Arts includes 79 two-sided Standards Cards with coordinating "I Can" Statements, 1 Title Card, and 5 Dividers. This kit is the perfect all-inclusive resource for language arts teachers to help provide focus for instruction in the perfect time-saving format. This kit offers a pre-printed, easily organized system that not only provides an entire list of Common Core State Standards in Language Arts for grade 6, but also provides a clear method of displaying the standard and the coordinating "I Can" statements in the classroom. Each kit will contain 5 divider cards, each representing the different anchor standards and domains. Use with the Daily Standards Pocket Chart (CD158174) to clearly and efficiently display the cards in your classroom. The original Complete Common Core Standards Kit for sixth grade Math includes 47 two-sided Standards Cards with coordinating "I Can" Statements, 1 Title Card, and 5 Dividers. This kit is the perfect all-inclusive resource for math teachers to help provide focus for instruction in the perfect time-saving format. This kit offers a pre-printed, easily organized system that not only provides an entire list of Common Core State Standards in Math for grade 6, but also provides a clear method of displaying the standard and the coordinating "I Can" statements in the classroom. Each kit contains 5 divider cards, each representing the different anchor standards and domains. Use with the Daily Standards Pocket Chart (CD158174) to clearly and efficiently display the cards in your classroom. 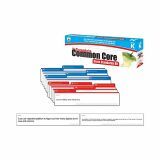 The original Complete Common Core Standards Kit for seventh grade Language Arts includes 76 two-sided Standards Cards with coordinating "I Can" Statements,1 Title Card, and 5 Dividers. This kit is the perfect all-inclusive resource for language arts teachers to help provide focus for instruction in the perfect time-saving format. This kit offers a pre-printed, easily organized system that not only provides an entire list of Common Core State Standards in Language Arts for grade 7, but also provides a clear method of displaying the standard and the coordinating "I Can" statements in the classroom. Each kit will contain 5 divider cards, each representing the different anchor standards and domains. Use with the Daily Standards Pocket Chart (CD158174) to clearly and efficiently display the cards in your classroom. The original Complete Common Core Standards Kit for seventh grade Math includes 43 two-sided Standards Cards with coordinating "I Can" Statements, 1 Title Card, and 5 Dividers. This kit is the perfect all-inclusive resource for math teachers to help provide focus for instruction in the perfect time-saving format. This kit offers a pre-printed, easily organized system that not only provides an entire list of Common Core State Standards in Math for grade 7, but also provides a clear method of displaying the standard and the coordinating "I Can" statements in the classroom. Each kit will contain 5 divider cards, each representing the different anchor standards and domains. Use with the Daily Standards Pocket Chart (CD158174) to clearly and efficiently display the cards in your classroom. The original Complete Common Core Standards Kit for eighth grade Language Arts includes 78 two-sided Standards Cards with coordinating "I Can" Statements, 1 Title Card, and 5 Dividers. This kit is the perfect all-inclusive resource for language arts teachers to help provide focus for instruction in the perfect time-saving format. This kit offers a pre-printed, easily organized system that not only provides an entire list of Common Core State Standards in Language Arts for grade 8, but also provides a clear method of displaying the standard and the coordinating "I Can" statements in the classroom. Each kit will contain 5 divider cards, each representing the different anchor standards and domains. Use with the Daily Standards Pocket Chart (CD158174) to clearly and efficiently display the cards in your classroom. The original Complete Common Core Standards Kit for eighth grade Math includes 36 two-sided Standards Cards with coordinating "I Can" Statements, 1 Title Card, and 5 Dividers. This kit is the perfect all-inclusive resource for math teachers to help provide focus for instruction in the perfect time-saving format. This kit offers a pre-printed, easily organized system that not only provides an entire list of Common Core State Standards in Math for grade 8, but also provides a clear method of displaying the standard and the coordinating "I Can" statements in the classroom. Each kit will contain 5 divider cards, each representing the different anchor standards and domains. Use with the Daily Standards Pocket Chart (CD158174) to clearly and efficiently display the cards in your classroom. Display the Common Core Standards and “I Can" statements in your classroom everyday! The Complete Common Core State Standards Kit is the perfect all-inclusive resource for first grade teachers to help provide focus for instruction in the perfect time-saving format. This kit offers a pre-printed, easily organized system that not only provides an entire list of Common Core State Standards in both math and language arts for grade 1, but also provides a clear method of displaying the standard and the coordinating "I Can" statements in the classroom. The kit comes with divider cards and 2-sided cards with "I Can" statements on one side and the corresponding standard on the other. Use with the Daily Standards Pocket Chart (CD158174) to clearly and efficiently display the cards in your classroom. Display the Common Core Standards and “I Can" statements in your classroom everyday! The Complete Common Core State Standards Kit is the perfect all-inclusive resource for second grade teachers to help provide focus for instruction in the perfect time-saving format. This kit offers a pre-printed, easily organized system that not only provides an entire list of Common Core State Standards in both math and language arts for grade 2, but also provides a clear method of displaying the standard and the coordinating "I Can" statements in the classroom. The kit comes with divider cards and 2-sided cards with "I Can" statements on one side and the corresponding standard on the other. Use with the Daily Standards Pocket Chart (CD158174) to clearly and efficiently display the cards in your classroom. Display the Common Core Standards and “I Can" statements in your classroom everyday! The Complete Common Core State Standards Kit is the perfect all-inclusive resource for third grade teachers to help provide focus for instruction in the perfect time-saving format. This kit offers a pre-printed, easily organized system that not only provides an entire list of Common Core State Standards in both math and language arts for grade 3, but also provides a clear method of displaying the standard and the coordinating "I Can" statements in the classroom. The kit comes with divider cards and 2-sided cards with "I Can" statements on one side and the corresponding standard on the other. Use with the Daily Standards Pocket Chart (CD158174) to clearly and efficiently display the cards in your classroom. Display the Common Core Standards and “I Can" statements in your classroom everyday! The Complete Common Core State Standards Kit is the perfect all-inclusive resource for fourth grade teachers to help provide focus for instruction in the perfect time-saving format. This kit offers a pre-printed, easily organized system that not only provides an entire list of Common Core State Standards in both math and language arts for grade 4, but also provides a clear method of displaying the standard and the coordinating "I Can" statements in the classroom. The kit comes with divider cards and 2-sided cards with "I Can" statements on one side and the corresponding standard on the other. Use with the Daily Standards Pocket Chart (CD158174) to clearly and efficiently display the cards in your classroom. Display the Common Core Standards and “I Can" statements in your classroom everyday! The Complete Common Core State Standards Kit is the perfect all-inclusive resource for fifth grade teachers to help provide focus for instruction in the perfect time-saving format. This kit offers a pre-printed, easily organized system that not only provides an entire list of Common Core State Standards in both math and language arts for grade 5, but also provides a clear method of displaying the standard and the coordinating "I Can" statements in the classroom. The kit comes with divider cards and 2-sided cards with "I Can" statements on one side and the corresponding standard on the other. Use with the Daily Standards Pocket Chart (CD158174) to clearly and efficiently display the cards in your classroom. Display the Common Core Standards and “I Can" statements in your classroom everyday! The Complete Common Core State Standards Kit is the perfect all-inclusive resource for Kindergarten teachers to help provide focus for instruction in the perfect time-saving format. This kit offers a pre-printed, easily organized system that not only provides an entire list of Common Core State Standards in both math and language arts for Kindergarten, but also provides a clear method of displaying the standard and the coordinating "I Can" statements in the classroom. The kit comes with divider cards and 2-sided cards with "I Can" statements on one side and the corresponding standard on the other. Use with the Daily Standards Pocket Chart (cd158174) to clearly and efficiently display the cards in your classroom.